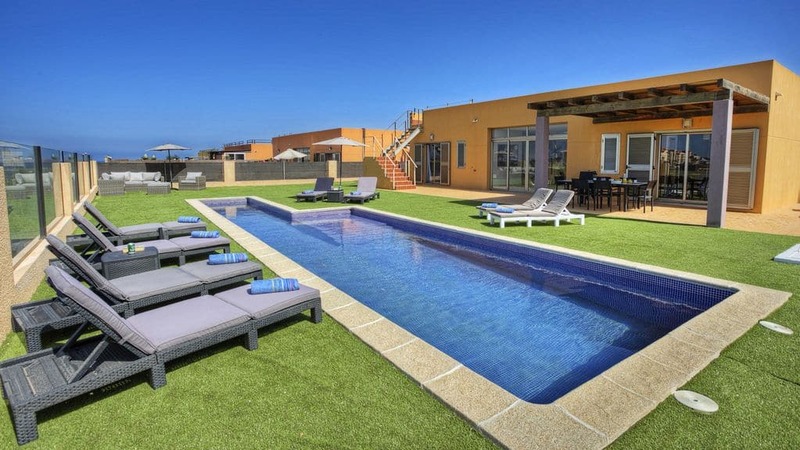 These are my selection of what I consider to be the best villas to rent in Caleta de Fuste Fuerteventura. I have chosen a wide variety from very exclusive large villas with private pools to smaller villas suitable for a small family. I hope you find something to suit your needs and your budget. 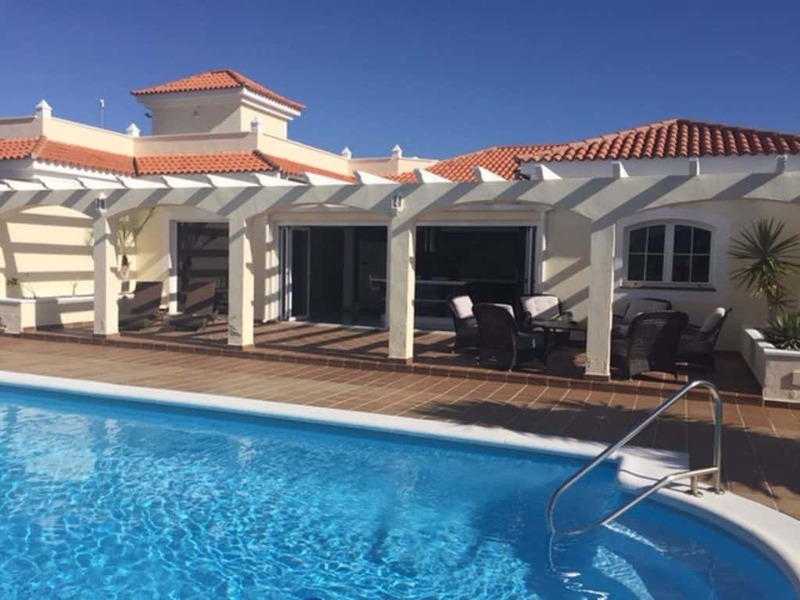 This is an absolutely beautiful 4 bedroom house with great views over Caleta and the sea. Each of the 4 double bedrooms has its own private bathroom and there are two more bathrooms just in case! It can sleep a total of 8 people in complete luxury. It has a large living room, a fully fitted kitchen. It features a heated swimming pool, so idea for winter rental too along with a lovely solarium with great views. There is a games room come gym with table tennis, gym equipment as a small sauna. This a lovely villa and in a lovely situation. 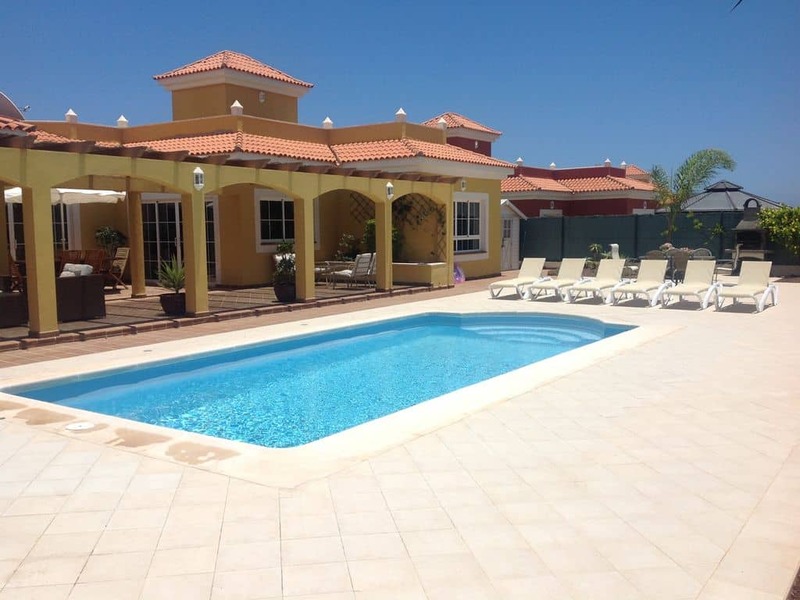 Probably one of the nicest villas to rent in Caleta de Fuste. I know because I have friends who own a similar villa just a few doors away. It has 4 bedrooms, 2 bathrooms and a luxuriously furnished lounge area. 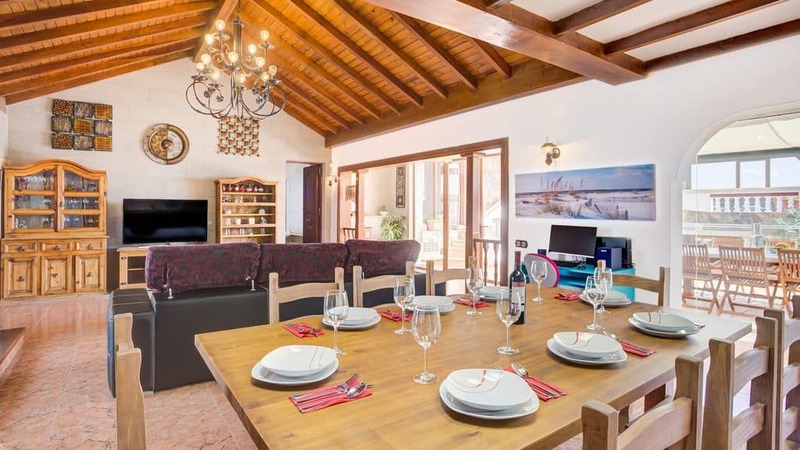 The villa has a modern open planned kitchen with island and dining table for dining. There is free WIFI and 70 inch LCD TV with full UK TV and sky sports, sky movies. Xbox in bedroom 2 and this TV has Netflix channels only. Also bedroom 1 has Netflix channels on TV. 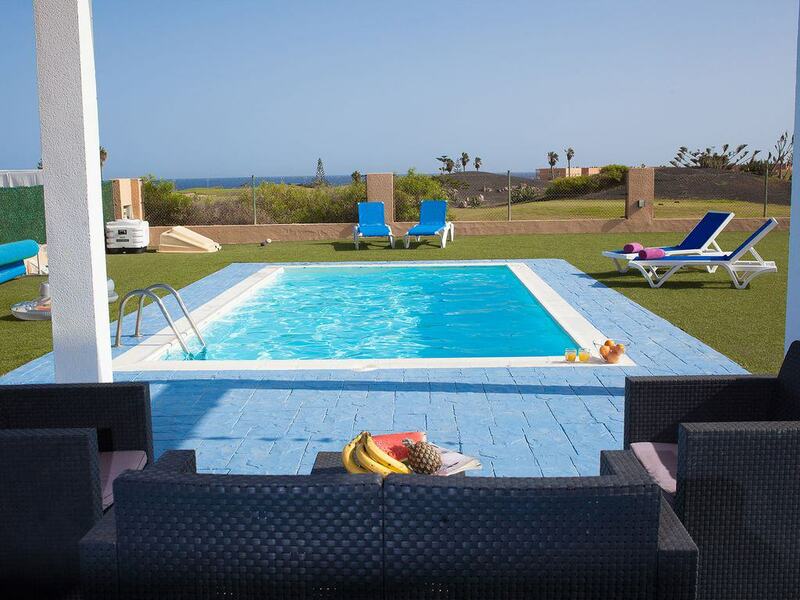 Outside there is a heated swimming pool overlooking the Fuerteventura Golf Club championship golf course along with sun loungers etc. Villa Birdie has a huge lounge room with AC, high ceilings and sky views. It has a dining table for 12, 3 comfortable sofas and a great 60 “satellite / Smart TV (various languages). There is another TV with DVD player in the master bedroom. Also there is a free Wifi connection, reliable and stable high speed ADSL. The kitchen is fully fitted with every mod-con and bathrooms are totally equipped (one of them with a bathtub). Outside is a heated swimming pool with a “swimming lane”. There are sun-loungers, 7 hammocks and the villa even has its own minigolf. From the garden you have great views of the golf course, the sea, and mountains. There are 4 bedrooms, sleeping up to 9 people. The master has an en-suite bathroom. Villa Lucuma has a dining/living room area with wonderful ocean views, a fully equipped kitchen (fridge, oven, stove, microwave, toaster, dishwasher, Nespresso machine, kettle and complete dinnerware for 9) with an additional dining table, and a separate laundry room equipped with washer and drier. There’s also a high chair and a baby cot available. The back garden is without a doubt the best feature of this villa. Its 8x4m heated swimming pool (heated to a comfortable 26ºC all year round) has a lateral in-water bench and it’s surrounded by green grass. On the deck by the pool there are comfortable sofas and an outdoor table (8pp) with a sunshade. The wooden reclining deck chairs around the pool give additional relaxing areas. There is also a BBQ in the pool area. 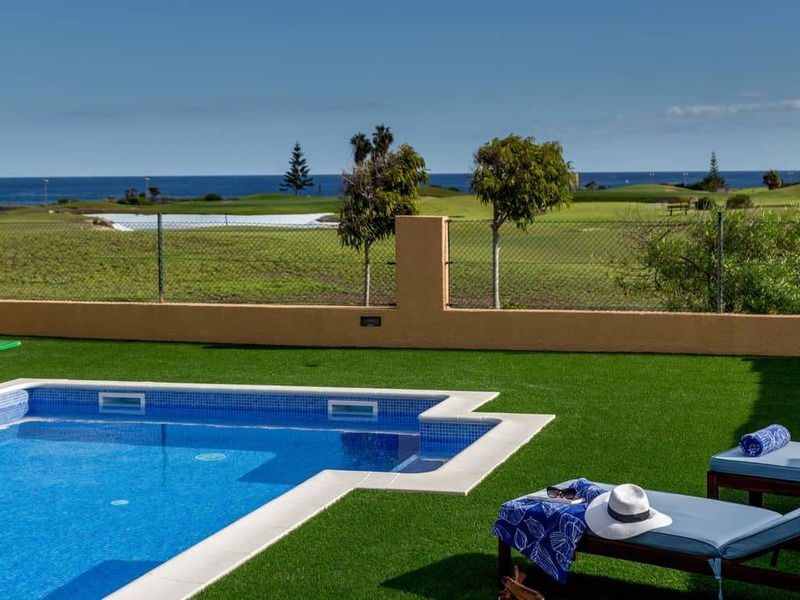 Villa Jasmine has extensive patios and private rooftop solarium where you can enjoy the panoramic scenery of Fuerteventura’s 18 hole Championship Golf Course and the surrounding hills. For sun worshipers the property is south facing and has sheltered patios from which you can view the golf and relax in the sun. Inside, the large open plan area comprises living and dining areas with furniture made from rich Australian hardwoods. There are three bedrooms sleeping up to 6, two bathrooms and a separate WC with a large hallway separating the living area for added privacy.The living area includes a large LG TV with UK TV Channels such as, BBC, ITV. There is also a Sky Box from which you can watch many other channels including movies. 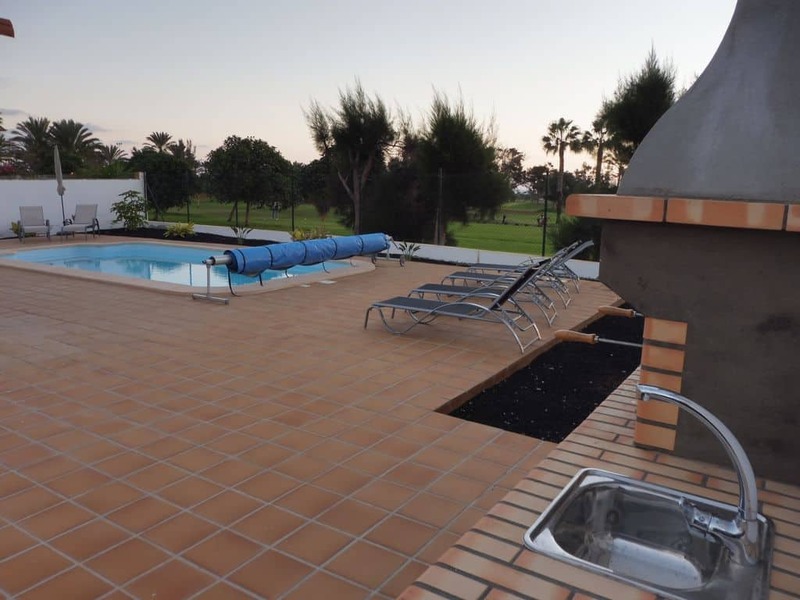 Outside is a private heated pool with showering facilities and BBQ. An extensive tiled area is available with an enclosed patio for al fresco dining. Villa Daisy is located in a very quiet and peaceful location and is only 10 Minutes’ walk to the beach, shops, bars, and restaurants. The golf course is also just 10min walk away. Shops and restaurants are also conveniently nearby at the local Atlantico Commercial Centre. The villa is furnished and equipped to accommodate 6 persons. The villa is beautifully appointed throughout, with top quality furnishings used. An outside staircase leads to a large fully tiled sun terrace on the first floor, offering a 360° view taking in the golf course, the local mountains, the Atlantic Ocean and you can even see the local yacht marina in the distance. The villa is full of character and offers a very comfortable living space which is screened to all sides offering maximum privacy. There is a wonderful 10m heated pool with separate kids pool and a play house. Villa Zoad is a beautiful villa with a fantastic private relaxation area. The south orientation of the house guarantees sun all day. There are three bedrooms sleeping 6 people together with 3 bathrooms, one en-suite to the master bedroom. The kitchen is fully fitted with dishwasher, washing machine and all the other appliances you may need. The back garden has been thoroughly renovated and includes a private heated swimming pool. Near the pool iare sun loungers and a “Balinese bed” to relax on. There is also a great barbecue area with seating and lighting. Villa Julaga is decorated in a modern and functional style. Inside there is a bright living-dining room that offers a large window overlooking the spectacular views of the pool and golf course. There is a large sofa, television, stereo and air conditioning. The villa also has a fully equipped kitchen, with refrigerator, microwave, coffee maker, toaster and a variety of appliances. Next to it there is a small solarium equipped with washing machine and drying rack. Villa Julaga has three bedrooms, one of them with double bed, private bathroom, fan and built-in wardrobes with shelves, drawers and hangers. The other two bedrooms each have two single beds. Outside there is a large pool, hammocks, barbecue and a large porch with dining table. In the upper part we can make use of a solarium to sunbathe in peace and tranquility.